Market 526: Sprint 21711 Easy Driver? Update December 1 2015: Sold! A very reasonable price I think. Maybe buyers were put off by the sellers ebay alias. Testa is head no? 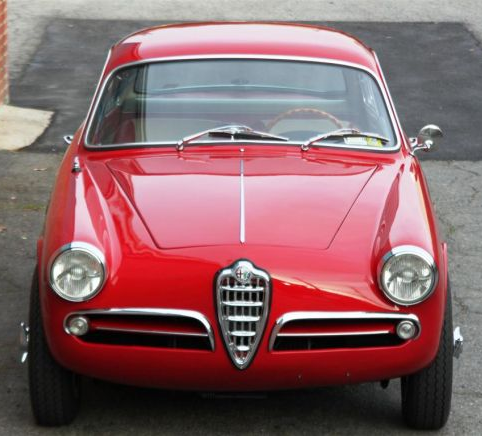 Giulietta Sprint 10105 1493*21711, 00536*16757, 6511501. This fellow is on eBay at the moment out of CT. It runs and would drive with some brake work and probably tuning. If I was looking to enter the market with something I could do some light work to and drive, while searching for parts before really digging into, this would be ideal. It doesn’t look like anything is missing that would keep it off the road, and a lot of the trim bits can be had in repro. 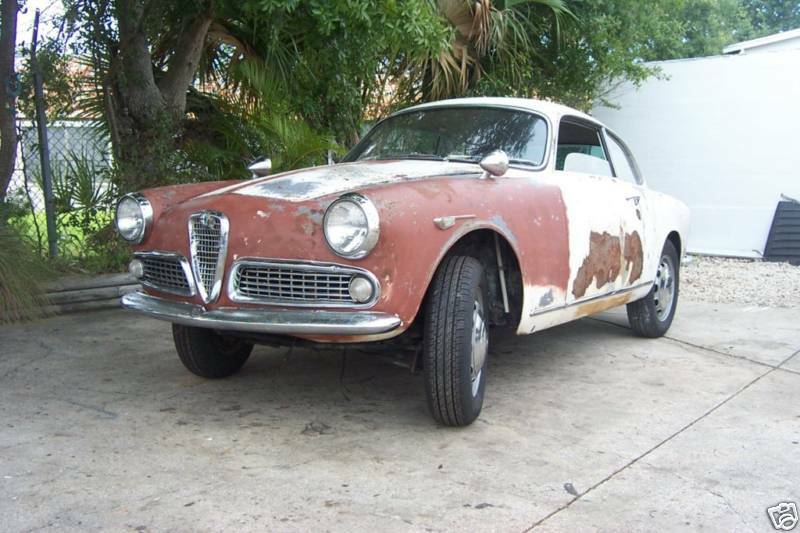 A reader has a complete engine for sale that would be ideal for this. Check it out. I want a white Sprint. Actually was originally Iseo Blue… I want an Iseo blue Sprint! I know a guy with some nice grills for sale that would work for this. Looks alright. October 29 2015: This car has come back on the market after a bit of a hibernation and a healthy coat of rattle can primer. Interesting to read my comments from 2008 and think about how the market has moved since. It probably changed hands for just under $10,000 back then, and now it’s already at $14,200 with 31 bids and just under 3 days to go. Amazing how things change. Looks like a nicer starting point today than it did 7 years ago. Also noteworthy is that this is a 10102, not a 10105, so it, has metric gauges and was originally probably meant for Italy -though it may have been a Mexico or Venezuela bound car. Anyone know if Mexico or Venezuela cars have Italian language gauge inserts? October 10 2008: I’m sure at least one of you out there were wondering what the seller wants for this car. Well wonder no longer, this car is available now on Hemmings website. Asking price is $11,900. Are we in a financial crisis or not? More pictures can be seen on Picasa (unless like me your employer blocks Picasa access for some reason). What do I think? For $11,900 this car should run, drive, stop and not make you worry about when you last had a Tetanus shot. Subtract the cost to make it so and you are back to a $5500 car. It is a free country though so be prepared to see this car on the market for a while. September 22 2008: Reserve not met! Bidding ended at $5950 with 15 bids placed. I bet the seller wanted $6000 and is trying to make a deal with the high bidder. Relists always fall flat and this is pretty good money for this car. 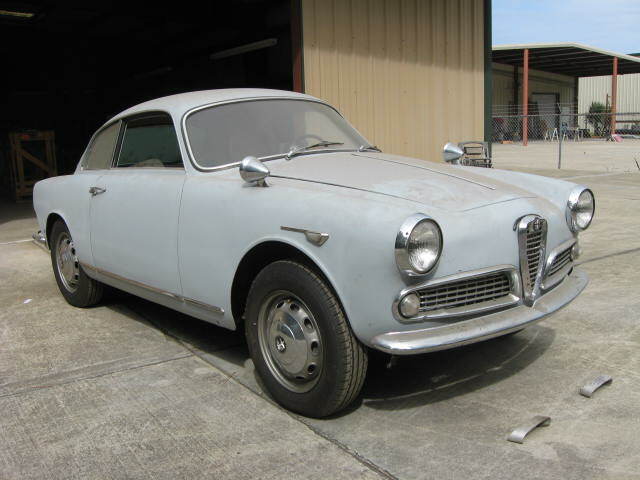 Giulietta Sprint 10102 1493*20205, engine 1315*010311. 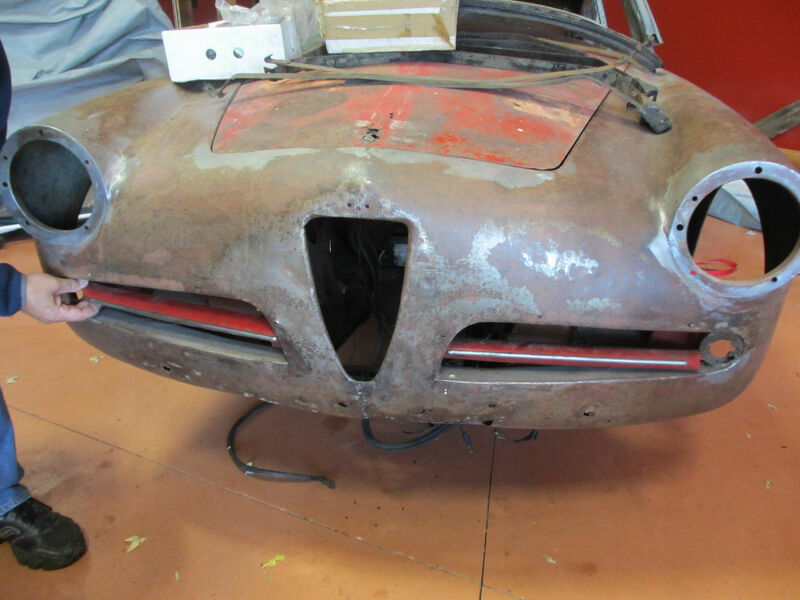 Here is a reportedly rust free 101 Sprint Project that is currently on eBay out of Florida. I would want to verify the rust free claim with pictures as Florida has a climate that promotes rust. Car wears new tires which is a plus at least as far as rolling it around while working on it is concerned and if they are of good quality your $300 ahead of the game. Everything on the outside is still bolted in place though it’s tough to tell for sure from the pictures it all looks reasonably straight. You can assume the ‘blush’ on the front of this car hides surface rust of the sort seen on the drivers door. I like the fender-forward mounted mirrors (maybe a Japanese market car?) and the trim looks good. If you are bidding, assume it will all need rechroming.